Small streams eventually become big rivers. That’s the commonsense principle behind the new Clean Water Rule, which will restore Clean Water Act protections to smaller streams and nearby wetlands. This week, clean water and wildlife saw an important victory as Congressional negotiators announced an omnibus spending bill that did not include a rider to block the water rule from moving forward — as had been widely rumored. For people and wildlife, this is good news. The rule was under attack in Congress just last month. But those on the Hill who oppose clean water are out of touch with the public. More than a million Americans personally gave input on the rule to the EPA — and 87% of those comments were in favor. The National Wildlife Federation did a nationwide poll of 1000 hunters and anglers—one of the most conservative constituencies in the country. It turns out that 83 percent of huntes and anglers want the EPA to protect streams and wetlands. The widespread support is not surprising — Streams protected by the rule provide drinking water for 117 million Americans. The rule will also benefit wildlife across the country: manatees in Florida, brook trout in Pennsylvania, mallards in Minnesota, salmon in Washington — to name just a few. 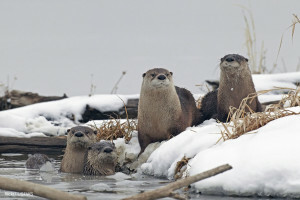 Clean water benefits numberous species of wildlife, from mantatees to mallards. Photo by John Muhilly. These smaller streams and wetlands were clearly protected by the Clean Water Act for three decades. But two controversial Supreme Court decisions cast the long-standing protections in doubt. The ensuing legal confusion has had consequences. It compromised federal enforcement in hundreds—probably thousands—of pollution cases. The rate of wetlands destruction increased by 140 percent immediately in the wake of the Supreme Court rulings. The omnibus spending bill was considered a likely venue to block or delay the rule, since it only needs a simple majority to pass, and is politically challenging for the President to veto. The rule still faces legal challenges, but we are confident that at the end of the day, this rule protecting our waters will become the law of the land. Help us defend the Clean Water Rule from further Congressional attacks!